I have bought some undetermined dinosaur teeth from Morocco. 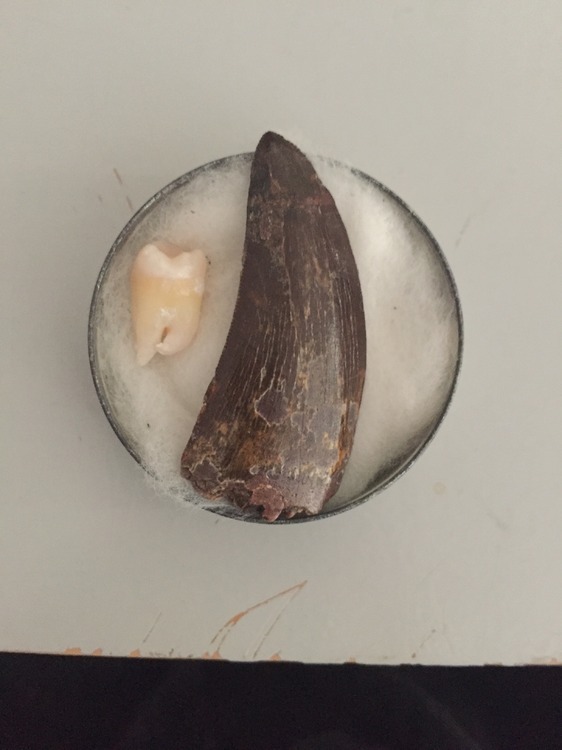 I know determination is very difficult with maroc Theropod teeth, but I am curious what your opinions are. The teeth are found in the Tegana formation from the Kem Kem deposits. Note: I know that the fossil in the right top is a chew plate from a generic fish. i think these are raptorlike dinosaurs, its a geues but i think it are. The piece in the top right is a crocodile scute. All the teeth appear raptor like with the exception of the one in the bottom right. The one in the bottom right is pterosaur? Agreed, they look like Raptor teeth. With the exception of the tooth in the bottom right which if I had to guess would be a Pterosaur tooth. Upon a second look the bottom right tooth looks more like a crocodile tooth than a Pterosaur tooth. 99% sure the piece in the top right is a crocodile scute. The one on the top right looks more like a crock scute to me as well. We are incapable of coming to this conclusion since no skull material has been found and consequently no teeth should be labeled to this dinosaur. I think the furthest you'll be able to label these teeth is Theropod tooth. Yes im sure it is a crocodile scute, no less cool though. I also agree with coming to a conclusion that the tooth in the bottom right is pterosaur. Yes definitely on the croc scute, but I am curious, runner64, as to why you call that tooth a pterosaur, and not a croc tooth. It's hard to tell from a photo but the tooth appears too compressed to be croc from my eyes. It also appears to have a little recurve which is exhibited in most pterosaur teeth while most croc teeth are pointy like spinosaurus. Yeah, it is hard to tell from a photo and I wil admit I don't know much about pterosaur teeth, but I would call it a croc. Then again, we just don't have pterosaur teeth in our Cretaceous. Top right croc scute. Since the scute is complete it might be possible to find out roughly where it sits on the body. Bottom left and bottom middle Abelisaurid probably. The back edge is very straight in Abelisaur teeth like there are on these. Bottom right croc tooth. As far as I know Pterosaur teeth from Kem Kem are thinner. I don't see any raptor/dromaeosaurid here. Raptors have recurved teeth. The serrations are also generally larger on the back compared to the front. Same with me, I'm not the best at ID croc, pterosaur, and fish teeth. I agree though that it is always difficult to ID from a photo. The pterosaur teeth I've seen from Morocco do seem somewhat thinner than the tooth on the far right but I agree its hard to tell from this photo. Here is a pterosaur tooth from Morocco. Thanks for al the great answers, it is a great help. When I get the fossils I wil make a better foto from the croc/pterosaur tooth to define what it is. 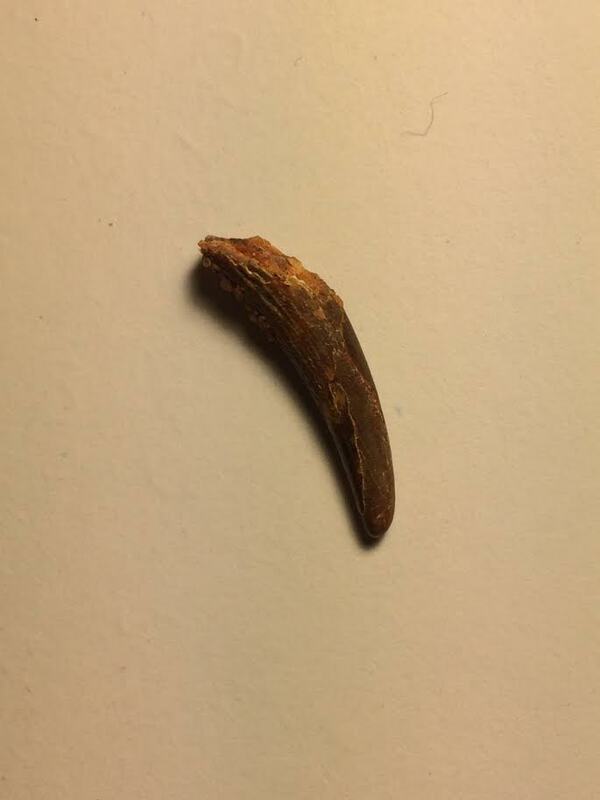 But now I have have another question, how can you distinguish raptor teeth from Abelisaurid? I have also this teeth, what was selling as Carcharodontosaurus but in my search to determine the teeth from my original post, I began doubting of this teeth is not a Abelisaurid.. It is also from the Kem Kem formations and plus minus 5 cm long. Raptor teeth are recurved and the back edge has larger serrations. Abelisaurid teeth have a straight back edge and serrations the same size as the front.